If you love the idea of having someone else put out a beach chair and umbrella for you, you’re at the right place! 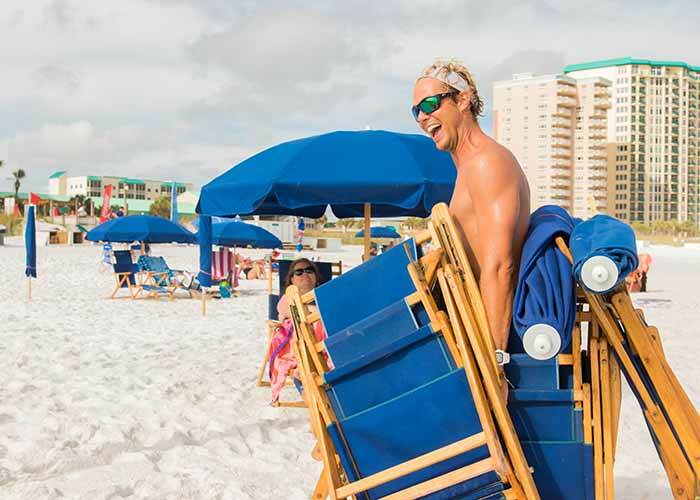 You can rent them at any time during your stay from the friendly beach service attendant. For added value be sure to check out some of the great money saving weekly packages offered by La Dolce Vita. 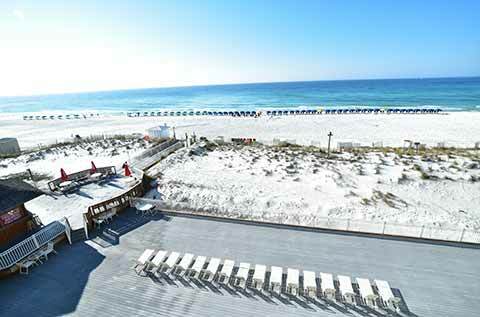 Watch the world go as you sip a cocktail on the sunny shores of the Gulf of Mexico. Looking for a little more excitement? Pick out a paddleboard or kayak and check the vantage on the warm waters of the Gulf of Mexico! No matter what your idea of a dream vacation, the Resorts of Pelican Beach delivers. On this special stretch of beach in Destin, guests and owners can now enjoy top-quality beach set-ups including umbrella & chair rentals, kayak rentals, and paddleboards. 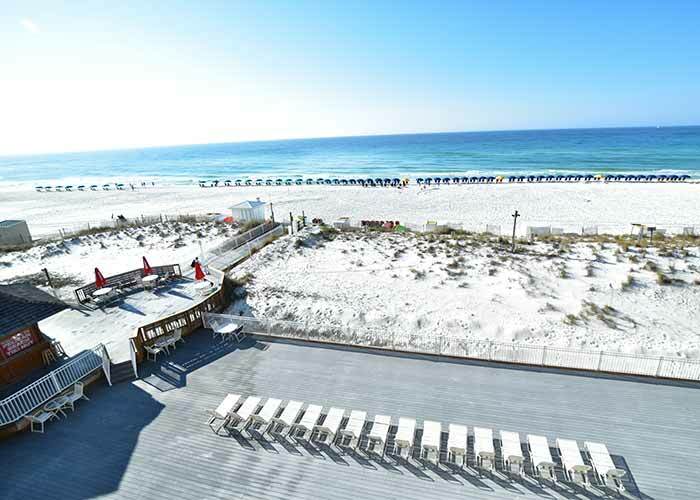 View our new Destin, Florida Beach Cam - right here at Pelican Beach! The Pelican Beach Cafè offers their full lunch menu for take-out or delivery by beach-side server deliver it directly to your beach chair. Please look for our servers to place your order! 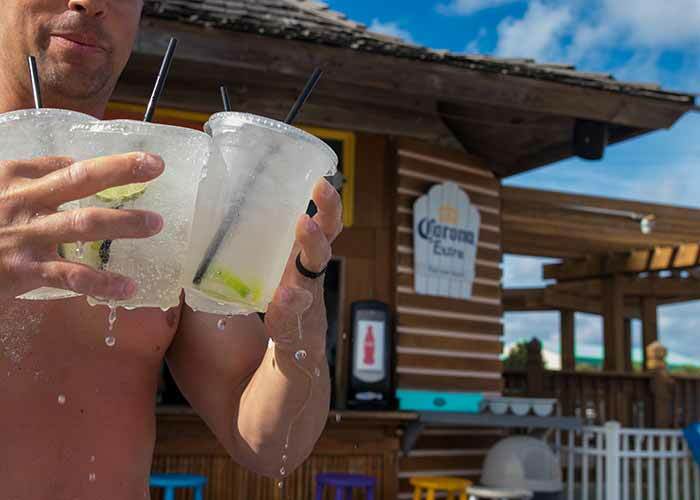 The Pelican Beach Tiki Bar will even mix up an exotic tropical beverage which you can order and have a beach-side server deliver it directly to your beach chair. Paradise truly has spectacular service! 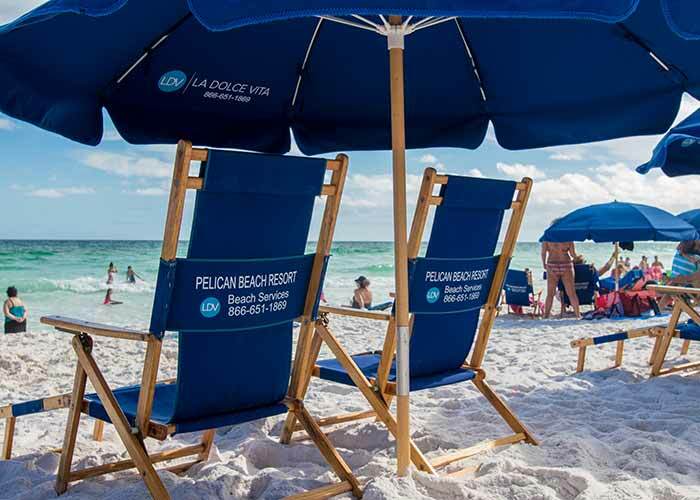 • All beach services are managed by La Dolce Vita under agreement with the Pelican Beach Resort Owners' Association. Policies are applicable to all guests and owners of the resort. 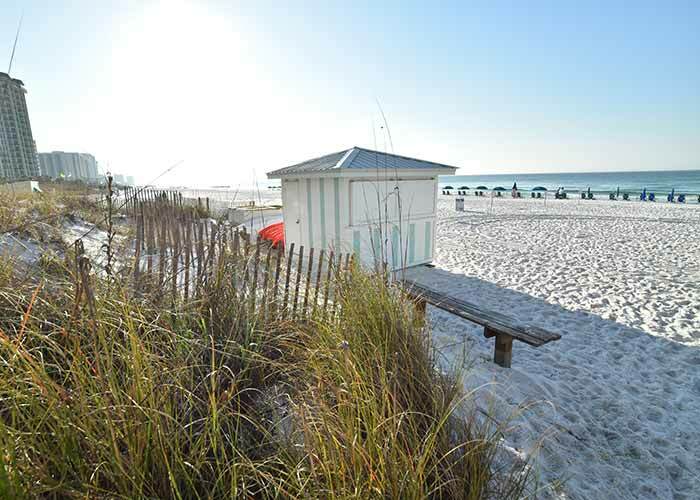 Beach set-ups may be rented directly on the beach the day of, based on availability. To reserve a beach setup in advance or for more information, please call (866) 651-1869 or reserve online. • Due to changing tides and weather conditions, beach setup placement may vary without notice. • The use of personal beach equipment (including chairs, umbrellas, etc.) is allowed, but they cannot be placed in front of beach service setups. Personal beach equipment may be placed in back of setups and may not be left overnight. 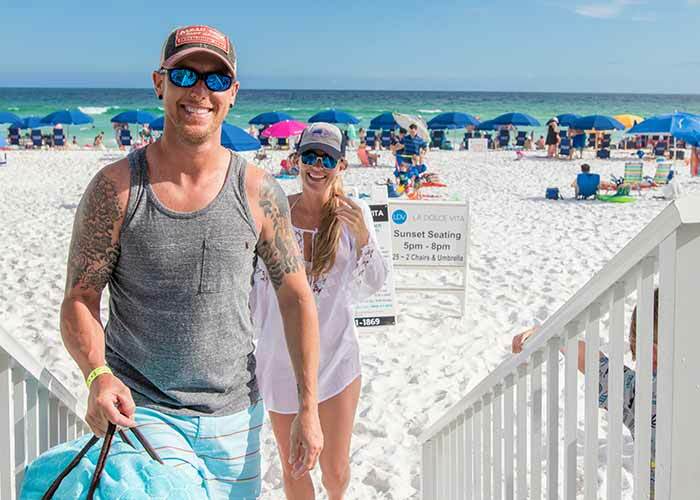 • There is a 20' public access easement from the high water line along the entire coastline to allow visitors to walk freely and enjoy the Destin shoreline. We refrain from any chair setups in this area to allow all of our guests plenty of unobstructed access to the water. 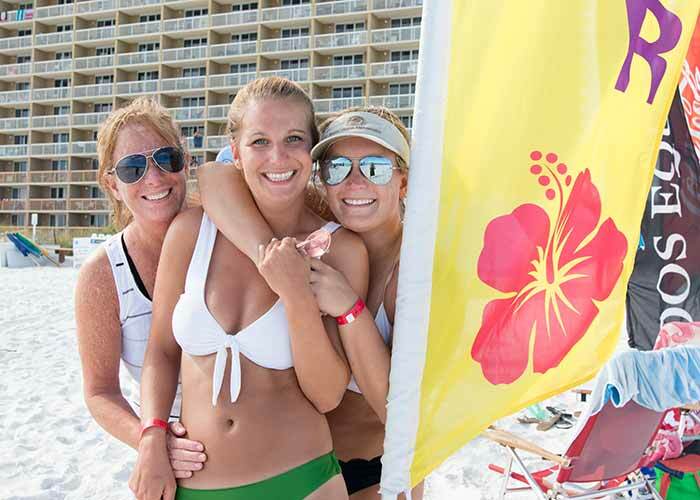 The beach service attendants are always working to ensure that our spectacular powder white beach remains safe and clean. 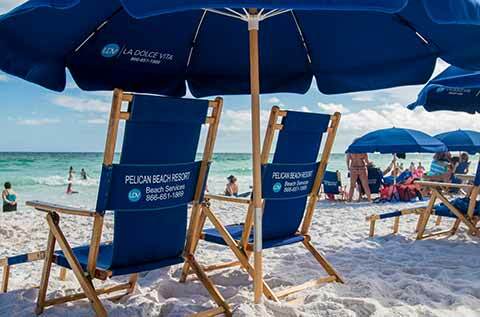 The hospitable and attentive La Dolce Vita beach service attendants are happy to assist guests with rentals of beach-side lounge chairs and umbrellas. To rent any of the items listed below, see the beach attendant at the end of the main boardwalk. Please settle any charges with the beach attendant before you check out. Sales tax not included. Please call (866) 651-1869 or reserve online to pre-order you set-ups or with any questions or concerns during your stay. Hours of operation are from: 9:00 AM to 5:00 PM from March 1 through October 31. 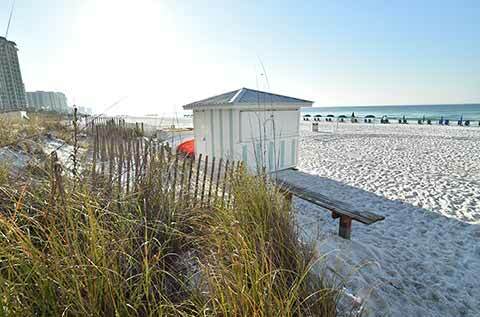 Beach rental rates are seasonal and subject to change without notice. Tax not included in the above prices. No weather-related refunds. Charis are set up rain or shine. 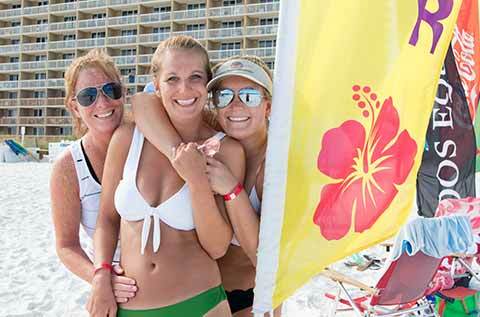 All water sport rentals include U.S.C.G. approved lifejackets, and necessary gear, this includes the safety checks and land lesson.